Well, here is the next storm that we need to watch. Looks like it has the potential to be a bad one with it coming on shore as a cat 3. Barb, looks like it's heading toward you and then cutting through Georgia and on to South Carolina. The forecast center track looks like it's right over Sumter when it gets here. We should know more by tomorrow morning. I was already off on Thursday and Friday but not sure what the plant is going to do. Thursday looks to be the worse day for us. Yes, it is supposed to come in here as a cat 3. I will be at chip's folks in a well built house. I'm worried about our trailers. They are both sitting on our lot and neither are currently tied down. Hope they survive. Praying for you, Barb. 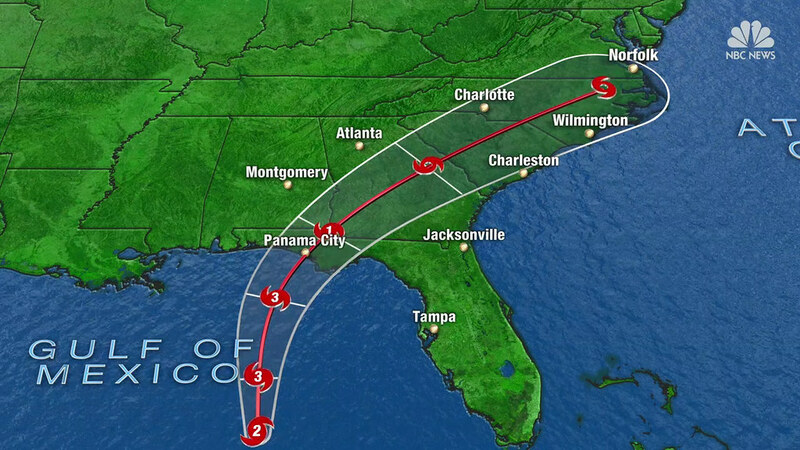 We are reading that it is coming in to Panama City. Makes me nervous for you. Yes looking like like a direct hit, and possibly a Cat 4 at landfall. Its gonna get bad. But we'll be ok. Stuff can be replaced. How far inland will you be when it arrives, Barb? Jennifer, how is your ground saturation point where you are? Have you had any flooding lately? Worrying about the flash flooding that we are being warned about and I know it will get to you before it gets to us. Sheri, hope you don't get too much more rain with flooding. I know your area got hit pretty hard with Florence. Good morning all. Dianna, I'm only about 15 Miles inland. Not far but much better than the 1/2 mile from the water where I was. Also not a mobile home. Right now we have much rain and some steady wind, not strong - yet. The storm is 145 mph now - Cat 4. It's going to get really bad this afternoon and I fully expect to lose power and internet. Maybe for days. I will poke in when I can. Everyone else in Michael's path, please stay safe. Rained on me all the way to work this morning. Lots of times I had to slow down to about 45 in order to see and the wipers were on high. Most mornings I get passed but no one was running fast this morning. Lots of water on the road slowed everyone down. I'm glad I have new tires! Michael has gained strength like the predictions because of the warm gulf water. Looks like it will be a Cat 4 at least when it makes landfall. They are saying we will get 50+ mph winds at some point. Mostly tomorrow early morning through the afternoon. By late afternoon Michael will be into North Carolina. Jim please don't send Michael to North Carolina. It has rained all night and all day but the weather people say it's a fluke thing and not part of Michael. It's rained so hard I can't see out the window. I just don't remember it raining for so long without it being part of something but that's what they say. Dianna my yard isn't flooded and usually doesn't. It's the trees falling over that concern me. Barb, hope you're ok. The schools are closed tomorrow here and where Colt goes. My Bible study has been cancelled for tomorrow too and I'm glad. I hope we keep power and I can just stay home. Barb marked herself safe on the app for Facebook. The friends we go to visit in Florida are safe, also. They weren't as close to the center of the storm as Barb. The mess is heading into Georgia now. I hope Jennifer can check in with us sometime tonight. Sheri, I was thinking about the ground being saturated before the storm even gets here/there. I am so glad that we don't have any large trees close to the house now. Michael is supposed to visit us starting at 8:00 in the morning and then he will be heading to NC in the afternoon. Hope you stay safe! here i am it's a mess, but mostly just a drippy one. no real rain. it started yesterday (they "said" it wouldn't until today) and the deputies are expecting the worst in the week hours tomorrow morning. i'm going to bed and not worrying about it. oh, and we are on high ground. not everyone is, but i'm good. It is windy outside with some rain. Woke up to it. Megan had to go to work in this mess and Jim had a doctor appointment. She made it in safely and Jim is safe back home now. We still have power for the time being, but it has flickered a time or two. Looking for this to be gone soon. We've had a little rain, not as much as we had yesterday which had nothing to do with Michael, and a little wind. Shelley is 16 miles SE from me and says her front yard, which is gigantic, is a pond and the wind is scary. May be coming my way. Hope not. From Barb: Me & mine are okay but haven't heard from my sister & her family. Please pray for them. Why I didn't find this thread before now, I don't know. I am glad everyone made it through. Now waiting on Barb's sister. OK folks. I have temporarily moved to Palm Harbor with my other sister. My sister in PC is fine. She and hers made it through safely and amazingly She got a tree one corner of her mobile home.The roof has a hole in it and the ceiling is cracked in the room I was staying in. And she was in one of the worst hit areas, However, we lost both the old and the new house. Adjuster is supposed to be out today. We will see what come of that. Krys and chip are still at Chip's folks house. They have a generator they run a few hours at a time, they get water and power when its running, and it keeps fridge and freezers cold. They sustained some damage to their sight built house (two windows gone, some water in house, going to have to replace wood floor), lost all trees (everyone did). Took two days to clear the road enough to get by to get out. Krys has been going to the house each day and trying to salvage what she can. Much isn't salvageable, but much is. We fared better than most. NO ONE in PC and surrounding areas that I'm aware of got away with no damage. The beach side however, barely looks like its been in a storm and they already have power and water. They are saying weeks to months before the rest of us are restored. Anyhow, I need to walk the dog before he makes a mess. I'm glad others came out ok.
Tina I heard about a storm in southern cali -- is that affecting you? Oh yeah, we no longer have any hospitals. Both hospitals were severely damaged. Ouch, Barb. I am so glad you and yours survived this. I am very sorry about all the damage. Is there some way we can be of help? I only got wet here from my storm. Now that's all dried up with winds. I've been sick and guess I didn't check here yesterday. Thought I did. Barb so glad you've checked in and things are better than worse. As I said in another thread, there really isn't anything anyone can do. A bit of good news the dealer for the new home said it is a total loss and they are ordering a new one for us. So we don't have to worry about any mold/mildew issues in a new home!! I will say though, if they hadn't declared it a total loss, we would have told them to take it back anyhow. Anything with that much water damage has to be a total loss. So it is the dealers responsility, Barb? Not charge to you and Kris? Exactly Tina. We still have to deal with the loss of the carport that was ripped off the shed. Krystal's Edsel was exposed and the hood flew off and is laying in the yard. All kinds of stuff damaged/missing. Chips compressor is off it's base (large compressor), etc. And she had no insurance.